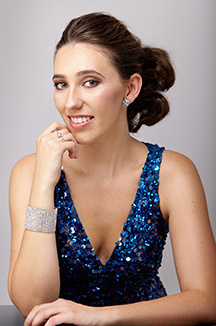 Sarah Prestwidge is a young up-and-coming Australian Soprano and scholarship recipient training at the prestigious Sydney Conservatorium of Music. Sarah has had numerous opportunities in the industry, including her debut concert at the age of sixteen, with mentors and original cast members from Phantom of the Opera. Sarah has performed both nationally and internationally for corporate and charitable events such as, The Anna Dudas Concert, Carols at the Cube, Rural Bushfire Brigade Aid, Corporate Clash, March Into Merivale Food and Wine Festival, and Opera in the Paddock. Sarah was also awarded a scholarship to study both language and music in Italy through AFS Intercultural Exchange. Sarah recently had her operatic debut in “La Traviata” with Opera New England. With a passion for classical music and ambitions of joining the world of Opera, Sarah is a rising star to look out for.